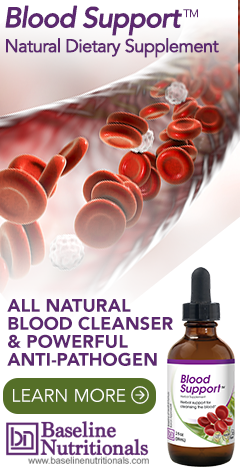 The blood detox is best combined with the Liver Detox, although the cleanse can be done by itself, especially if you have special health conditions and need added support. Use 4 droppers of Blood Support™ (4 mL), 3 times a day--be sure to shake the bottle well before each use. At 12 droppers per day, each bottle of Blood Support® lasts approximately 5 days. Use the following regimen until the bottle is done. For some people who don't mind the taste of the formula, you can simply just drop it straight into the mouth and follow with water. For those who are not fond of the taste, you can mix with juice. Drink 128 ounces of water throughout the day. Continue with the Blood Support™ until the bottle is done. You will be taking 12 droppers worth of the Blood tincture each a day. Each bottle contains about 60 droppers which means you'll finish one bottle in 5 to 5 ½ days. Note: To get past the taste (very bitter, very hot), Jon recommends adding it to 2 oz of thin, sweet undiluted juice such as apple or grape, downing it in one gulp like a shot of liquor, and then swishing some plain juice in your mouth to clear the taste. (By the way, although normally not a fan of bottled juices, this is one place where they actually work because they are so convenient and because you drink so little at a time.) Thick juices such as peach or orange, on the other hand, tend to coat the mouth, which makes the taste linger -- not good. And diluting it simply means you have to drink more, rather than getting it all down in one quick gulp. Do you recommend doing all these one after the other without days off? If a rejuvenation ayurvedic treatment can be planned when would be the ideal timing? You can combine the Liver and Blood Cleanse, and yes, you can do them all back to back, just keep to the order. Please work with your health practioner on rejuvenation ayurvedic treatments that would work with your body, if that is something you want to add. Be sure they understand all the herbs you are already doing, how they work and why, so you do not overdo it. Remember, this is a very powerful detox with rebuilding herbs already incorporated. Be sure to read the final steps on rebuilding after the detox. So, I am new to the detox process.I have not received my shipment in yet. Hoping to get the best understanding of preparing for the cleanse and not mess up any of the steps. i would like to know Is it recommended to incorporate all three phases in the 30 day time period or should the 30 day colon cleanse be completed within that time and then followed by the next two phases?